Service members don’t sign up for a life with the military for the freebies and discounts. But once a year when restaurants, retailers, and local businesses offer free meals, discounted merchandise, and free admission, it’d be plain silly to refuse. To cash in on the following deals, you must be a veteran or active duty service member and be able to present proof of service. Applebees Free meal from the Veteran’s Day Menu November 11. Back Yard Burgers Free Back Yard Classic Burger on November 11. Bj’s Brewhouse Complimentary entree up to $12.99 and an alcoholic beverage for $6 on November 10 and 11. Black Angus Steakhouse Discounted 8 oz. top sirloin steak meal with mashed potatoes, and broccoli from open to 3 p.m. November 11. Bob Evans One free breakfast, lunch, or dinner meal from select menu on November 11. California Pizza Kitchen Complimentary meal from a select Veterans Day Menu on November 11. Chick-Fil-A Every day, Chick-Fil-A offers a 10% discount to active duty service members in uniform. Chipotle Veterans, active duty service members, and military spouses with valid ID are offered a BOGO burrito, bowl, salad, or tacos on November 7. Cracker Barrel Complimentary piece of Double Chocolate Fudge Coca-Cola® Cake on November 11. Denny's Free build your own Grand Slam breakfast November 10, 5 a.m. to noon. Dunkin’ Donuts Free donut November 11. Famous Dave’s Free Two Meat Salute November 11. Firebirds Wood Fired Grill Veteran's or active duty service member's meal is free when you choose to dine with them November 10. Their meal must be less than or equal to yours. Hooters Free meal from the Hooters Veterans Day Menu November 11. IHOP Free Red, White, & Blue Pancakes November 10 for all veterans and active duty service members. Krystal A complimentary sausage breakfast on November 11 during breakfast hours. Little Caesars Free $5 lunch combo November 11, 11 a.m.- 12 p.m.
Macaroni Grill Free Mom’s Ricotta Spaghetti and Meatballs meal on November 11. On the Border Free Create-Your-Own combo meal with rice and beans, and chips and salsa on November 11. Outback Steakhouse Free Bloomin’ Onion and beverage on November 11. And 20% off purchase November 12-16. Red Lobster Free appetizer or dessert on November 11. Red Robin Free Red’s Tavern Double Burger and Bottomless Steak Fries on November 11. Rib Crib Free meal off the Menu of Honor on November 11. Ruby Tuesday Free appetizer on November 11. Texas Roadhouse Free lunch from the Veterans Menu on November 11. TGI Fridays Free lunch to $12 from 11 a.m. to 2 p.m. local time, November 11. Guests will also receive a $5 coupon for their next meal at Fridays. Wienerschnitzel Free chili dog, small fries, and small Pepsi on November 11. World of Beer One free beer on them, November 11. Bed Bath & Beyond 20% off purchases November 10-13. Cabela's 5% off qualified purchases. Dell Additional 15% off Dell.com purchases. Dollar General 11% discount on November 11. Goodwill 50% off donated apparel November 11. Home Depot Offers 10% off your purchase every day including November 11. JC Penney Portrait Free 8x10 portrait, free session fees, $99 digital album, and 50% off photo purchase or $3.99 standard prints with ID and coupon year-round. Lowes Offers 10% off your purchase every day including November 11. Nike 10% off purchases every day. Publix 10% off purchases on November 11. Rack Room Shoes 10% off purchase on November 11. Also honored Memorial Day and the Fourth of July. Tractor Supply Co 15% off in-store purchases November 11. Under Armour 10% off purchase for veterans, service members, military spouses, and family members online and in-store every day. Walgreens 20% discount on eligible purchases on November 11 for veterans, service members, and immediate family members. Must have Walgreens Balance Rewards Card and ID. Many of your frequented retail shops offer a 10% military discount year-round for veterans, service members, and military spouses. Just ask at checkout! 9/11 Memorial and Museum Free admission for veterans and two half-priced tickets for family members November 8-12. Army Corps of Engineers Recreation Areas Free admission on November 11 for veterans, service members, and their families. 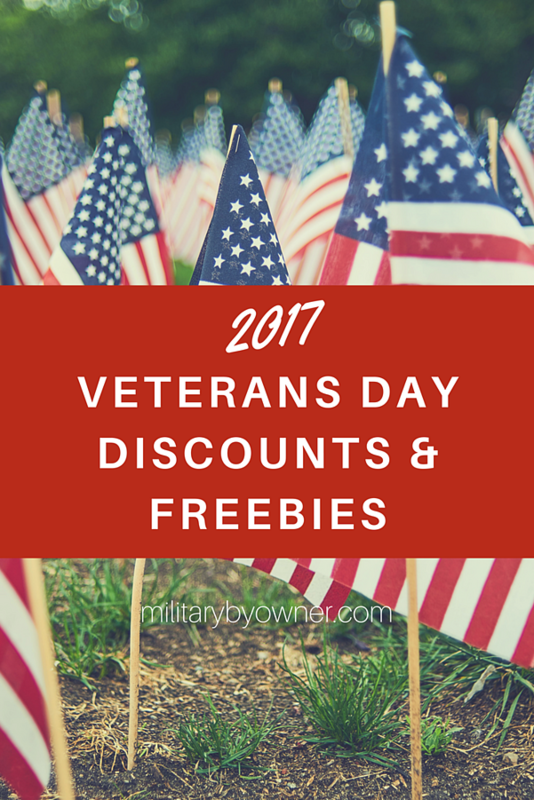 B&B’s for Vets One free night’s stay on or around November 11. Birmingham Zoo Free admission for veterans, service members, and their families November 11 and 12. Boston Duck Tours Free rides November 6-10 for veterans and active duty service members. Dependents ride for $10. Carnival Cruise Lines Book with deposits from $99, plus receive $50 for onboard purchases and free room upgrades. Valid on sailings through April 2019. Harley-Davidson Museum Free museum entry for all veterans, active duty service members, and their families November 10-12. Killington Resort Free Killington/Pico Express Card plus one free lift ticket on November 11. This deal is also available on Memorial Day. Knott's Berry Farm Free admission for veterans and active duty service members and one guest November 1-16 and November 27- December 15. Legoland California offers discounted tickets at your base's Information, Tickets, and Travel (ITT) office or 10% off at the door everyday. Legoland Florida offers free tickets to service members and discounted tickets for family members through your bases ITT office or 10% off at the door every day. Mariner’s Museum $5 admission for veterans, service members, and families November 10-12. Mount Vernon Free admission November 11, 11 a.m. to 4 p.m.
National WWI Museum and Memorial Free admission for veterans and active duty service members. 50% off tickets for civilians November 10-12. National Parks All parks that charge admission will have free entry for everyone November 11 and 12. Natural History Museum of Utah Free admission November 10-12. New Mexico Museum of Space History Free admission for veterans November 11. Newseum Free admission for service members and one guest November 10-12. Point Defiance Zoo and Aquarium Free admission for veterans and active duty service members and 50% of tickets for immediate family members November 10-12. Pro Football Hall of Fame Free admission plus one guest for veterans and active duty service members November 1-30. Riverbanks Zoo and Garden Free admission November 11. Woodland Park Zoo Free admission for veterans, active duty service members, and spouses November 11. World of Coca-Cola Veterans and active duty service members may purchase up to four tickets at 50% off now through November 12. American Family Care Free flu shots November 11. Grace for Vets Free car wash November 11. Great Clips Free haircut November 11 or card for free haircut to use anytime before December 31, 2017. Sports Clips Free haircut November 11. 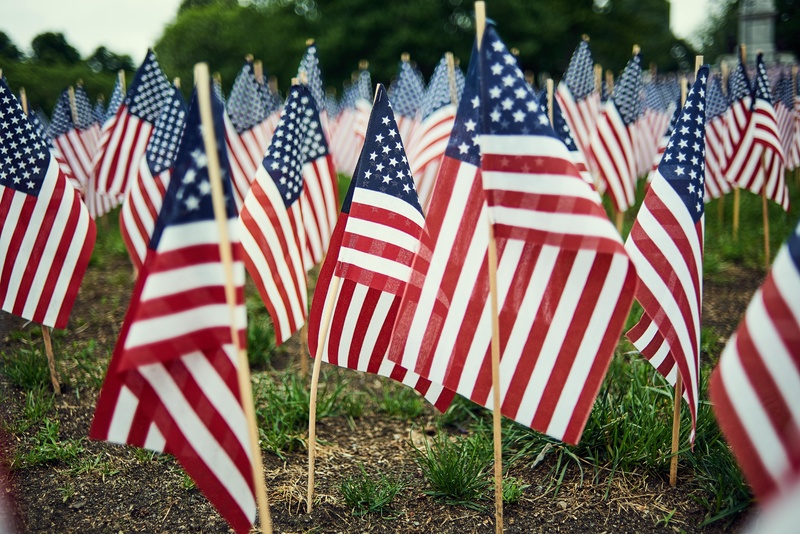 As Veterans Day, approaches enjoy the freebies and discounts the community offers. And take a minute to be thankful for the sacrifices our veterans, service members, and their families make every day to protect this country. Keep in mind that this a general list, and you’re encouraged to call your local businesses to verify their participation. See something we missed? Please feel free to comment below!